All Venetians eventually take that last gondola ride to San Michele, Venice’s walled cemetery island, where the massive cypresses shoot up like the pinnacles of a secret evergreen metropolis. 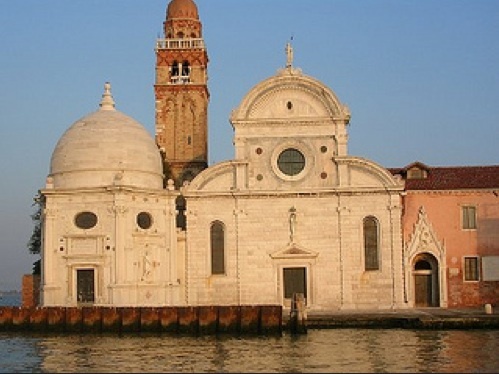 The first church was built on the island in the 10th century, and from 1212 to 1810 it belonged to a Camaldolesian monastery that produced many scholars, most notably the cosmographer Fra Mauro (d. 1459). Next to San Michele’s vaporetto stop stands Mauro Codussi’s first work in Venice, the church of San Michele (1469), revolutionary not only in its style (an adaptation of the local Gothic tri-lobed church) but in its use of white Istrian stone in its façade, which soon became the rage in Venice. What really sets it apart from its many imitations is not only its location right on the lagoon, but its sidekick off to the left, the striking hexagonal Cappella Emiliana, with an unusual hemispherical dome resembling a Mycenaean or Etruscan tholos, covered in the same white Istrian stone. Commissioned from Guglielmo dei Grigi by the Procuratori di San Marco, (1528-43) it was built with funds bequeathed by Margherita Vitturi, the widow of Giovambattista Miani (or Emiliani, hence its name) as a votive in memory of her husband. Its dome (masonry inside, stone inside and out) has often proved challenging to restorers. If the front door isn’t open, go under the gateway to the right, under the carving of St George and the Dragon, and cross the pretty cloister to the church’s second entrance. The great Fra Paolo Sarpi (d. 1623), is buried under the lozenge by the front door; his remains were relocated here when his monastery San Servolo was demolished in 1828. Otherwise, San Michele’s interior, with its muddled proportions, lacks the conviction of the façade; the best bit is the interior of the Cappella Emiliana, a pale marbled Renaissance gem in coloured marbles. The cemetery is joined from the cloister of the church. As in any Italian campo santo, the deceased, depending on the station they attained in life, are installed in detached houses, villas, or council flats; here though, after 10 years, the lease is up (unless you pay extra) and the bones are shipped out to an ossuary to make room for a new tenant. Signs indicate the way to the ‘Acattolica’ (non-Catholic) section to the left of the first hemicycle, where Time and Neglect have staged a trial run for the Judgement Day. But here lie the cemetery’s foreign celebrities: Serge Diaghilev (1872–1929), whose burial was marked by a devotee leaping into the open tomb, and Diaghilev’s favourite composer, Igor Stravinsky (1882–1971), who died in New York but requested to be buried here, in the Russian Orthodox section; the Venetians were so pleased that they gave him a doge-like funeral in Santi Giovanni e Paolo. In the Protestant section you can find the quiet, rather neglected tombs of two writers who were certainly cranky and unpleasant enough in life, Baron Corvo and Ezra Pound. To get to these you must pass through a section of children’s tombs. Venice traditionally had one of the highest birthrates in Italy, perhaps because the mortality rate historically has been high; when a child died, parents comforted themselves with the thought that they would serve as advocates for the family in Heaven. The cemetery island appears in a couple of films: The Wings of the Dove, the 1997 film adapted from Henry James's novel, and in the scene of the princess's funeral in Vampire in Venice (1986).